Did you know you can conveniently buy movie tickets for SM Cinema online? If yes, well, you can ignore this post but feel free to stick around for other interesting articles. But in case you didn't yet, head over to https://www.smcinema.com and buy movie tickets online. You can purchase tickets based on movie title or based on a preferred SM location. Selecting the first option will ask you to further choose an SM Cinema branch and schedule so you might as well just pick the second method. 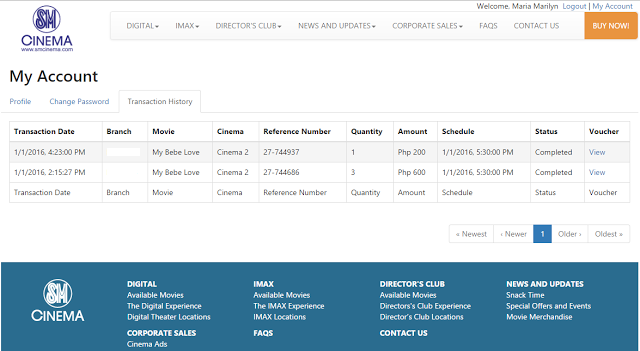 By choosing a specific SM place, the movies showing on that branch along with schedules will then show so you can easily select. You may even book for movies in advance (limited participating cinemas only). Ticket purchase can be completed as a guest or as a registered member. Payment is possible through the ePlus card or a credit card. This option was very handy for us during one of the most movie booked dates of the year - New Year (along with Christmas Day). The discovery all started when we headed over to a local Robinson's mall (Robinson's Place Pangasinan to be exact), thinking there won't be as many people there. Wrong! The file for all movies showing was very long. I tried to book a ticket via the RobinsonsMovieWorld.com site but it wasn't available at that time. So we drove all the way back to SM City Rosales. While on the road (I wasn't driving), I tried SM Cinema online and it worked fine. We were able to avoid the long line by simply showing the tickets through the ePlus counter.